Old photo supplied by Geoff Chapman. 1910 internal photo from Current Accounts July 1973 issue. 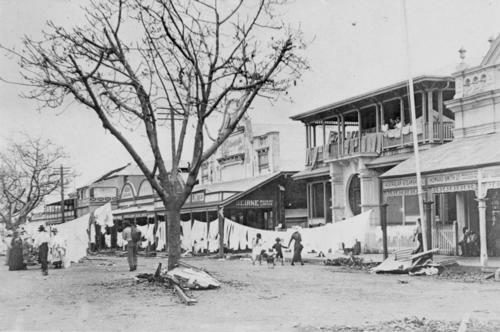 1918 Photo from picture Australia showing carpets etc of CBC Mackay branch being hung to dry after cyclone of 20/21 January. 1963 There is a photo in Current Accounts July issue p16. 1974 photo in Current Accounts January 1975 issue. 2007 photo as Accountants office by Bob Wilmot. Malanda Malanda is on the Atherton Tableland, 85Km from Cairns. 1909 opened by Mr Malanby Dunn. 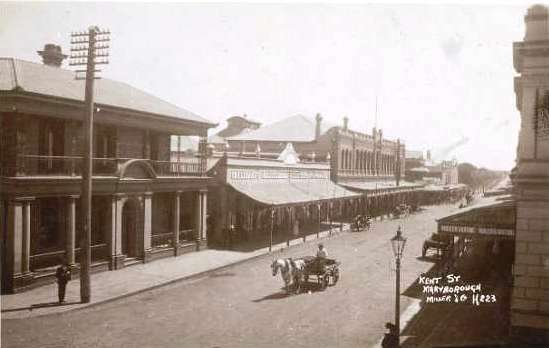 He came from Manager Narromine, which was opened by Mr Dunn in 1898. 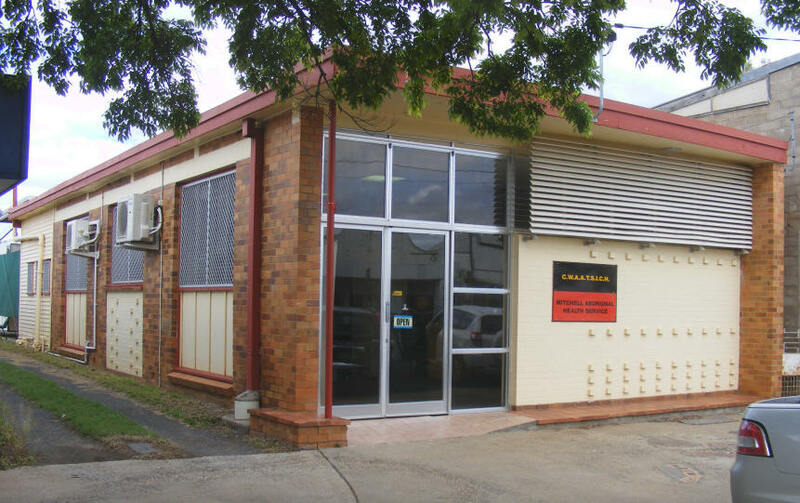 1911 The business of Peeramon was transferred to Malanda when Peeramon branch closed. 1863 A move was made to a second building of brick and slate erected, which exhibited a 'Regency' influence in its architecture. 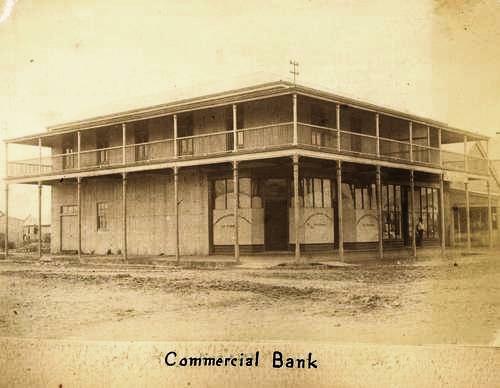 1869 The third building occupied by the Commercial Banking Co. of Sydney was designed by the architects Benjamin and Joseph Backhouse and was opened in 1869. Second photo. It was situated on the corner of Richmond and Kent Streets. [State Library of Qld]. 1874 Advertisement in Maryborough Almanac. 1893 photo of floods with CBC on left [State Library of Qld]. 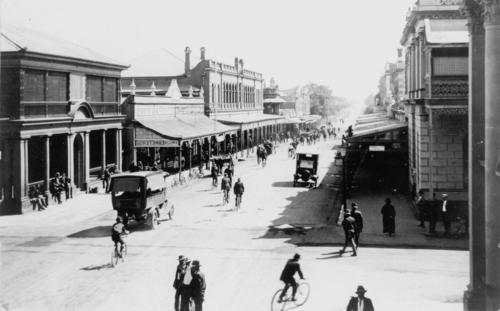 1910 second photo of Kent Street from NAB archives. 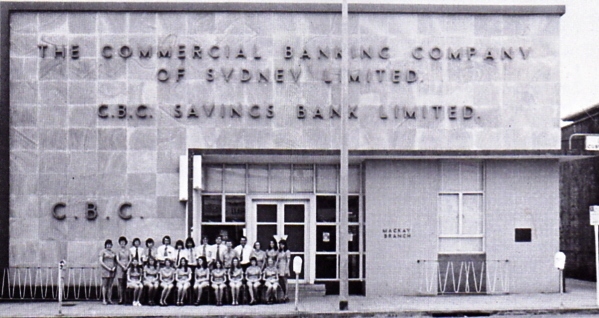 1961 Third CBC Bank building was demolished. 2009 May Ian Holston advises that he and Max Vardy spent about 5 hours in Maryborough. 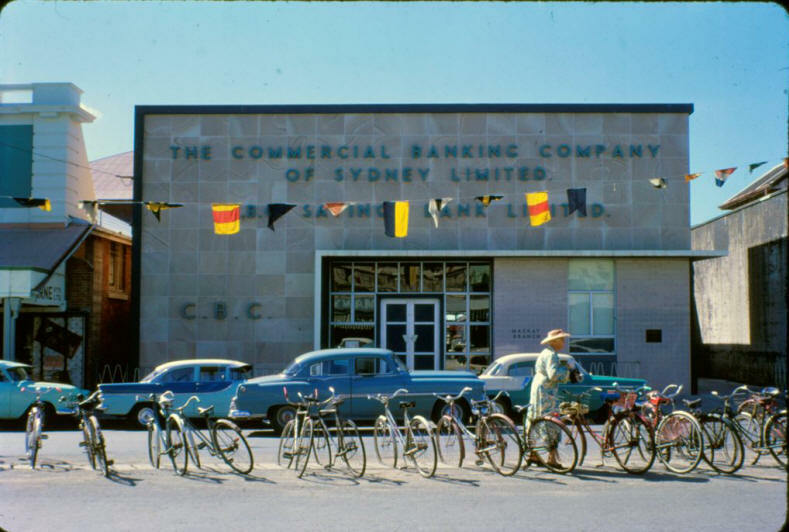 You may be aware but surprisingly the CBC was the first Bank in the City. Unfortunately the original premises were knocked down in approx 1961, and we erected a pretty average building. The NAB Business Banking operation is about to move out of these premises, however they have assured me that they will be taking the Bronze Plaque that is on the premises and would have been placed there by Queensland Marketing (probably Ray Knight). 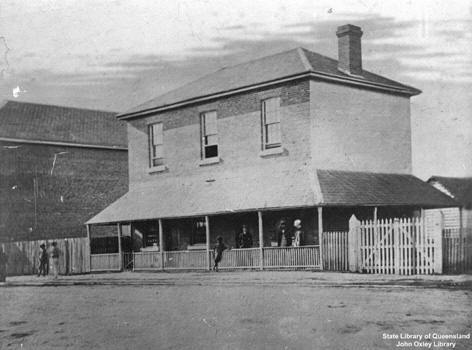 This plaque states that we were the first Bank in Maryborough, there is also a photo of the old premises in the Banking Chamber. Unfortunately the local Historical Society was not aware of this. I have advised them to contact them and get a copy as well as looking at your magnificent Website which has 4 fantastic photos of the premises. The Society do acknowledge in their very nice History of the City booklet that we were the first Bank, however there is not a picture., The Historical Society is located in the old Wales building. 2011 1958 photo is of Millmerran branch remains after a fire on 22nd September from Current Accounts Jan 1959. 2011 October John Munro advised: "I am attaching a few pix of exCBC buildings I found on a recent visit to Lightning Ridge. 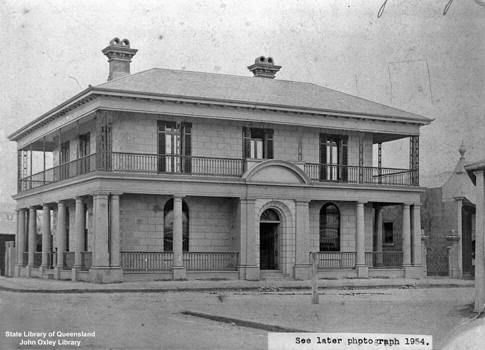 The Original CBC Milmerran site is now the Council Chambers - built on the spot where the CBC burnt down. 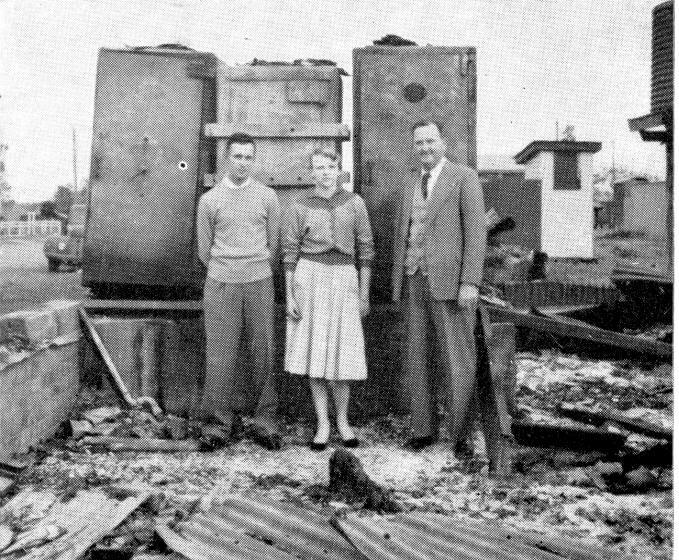 The building was burnt down on a Saturday and the Bank opened on Monday in a Boarding House next door - it no longer exists. The exCBC building was identified for me by a local who built the foundations for the CBC after the fire. This building is presently vacant and is advertised "For Lease". On the Bruce Highway 150Km north of Bundaberg. 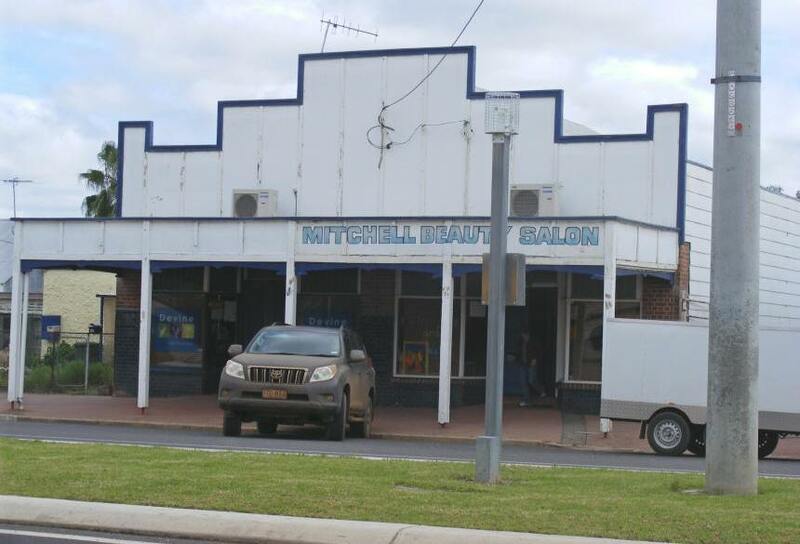 Miriam Vale is the turnoff for the town of 1770. Was a full branch in 1935. Downgrading to an R/O must have occurred sometime later. 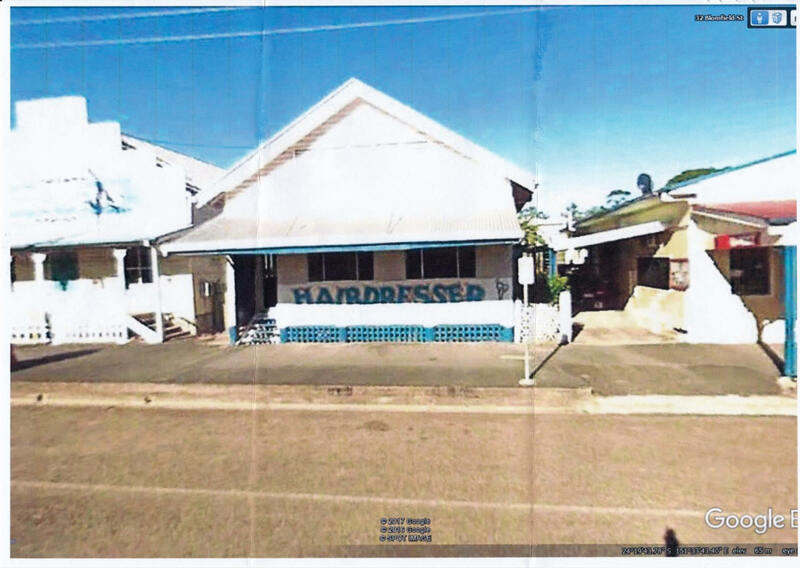 2017 Google picture provided by Geoff Chapman who says it is now occupied as a hairdressing salon, but premises were originally the Miriam Vale CBC branch , as advised by the local historical society. 2010 No. 46 Mitchell is on the Maranoa River (which flows on to join the Condamine - Darling - Murray River System) 600Km west of Brisbane, between Roma and Charleville -1104 feet above sea level - on one of the main western arteries - the Warrego Highway - yearly rainfall 21.5 inches. Commercial centre for a rural (sheep and cattle) shire of 10,600 square miles. 1846 explorer Sir Thomas Mitchell passed through the area. (who gave a report in Current Accounts January 1975). 2010 September photos by Frank Maundrell who says: "No. 45 was the original CBC Branch. It is now used as a Beauty Salon. In the early 1960's a new building was built at No. 46 Cambridge Street, almost directly opposite the old building. The Aboriginal Health Service now occupies the building. Source of this information was an elderly lady in charge of a local Historical Society display in a shop near both buildings." Moreton Bay - Board Minute 24 July, 1849. 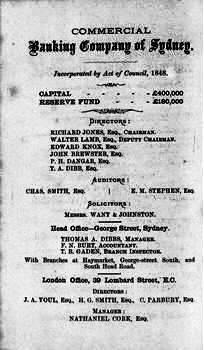 Ipswich, Moreton Bay - an agency business only - Board Minute 5 April, 1850. 1967 Mount Isa is 110 miles from NT border, 600 miles west of Townsville, 1000 miles north of Brisbane / Adelaide, 900 miles SE of Darwin. 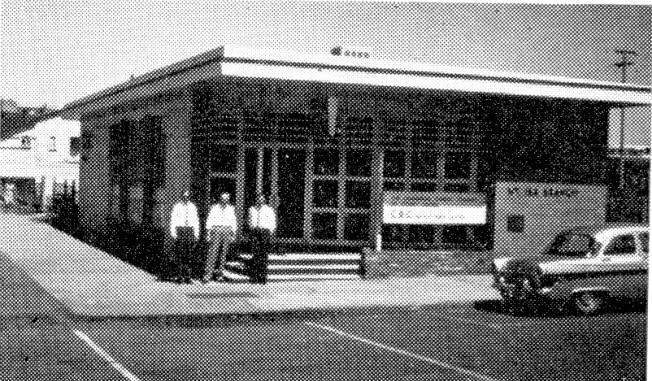 1968 Jan Current Accounts Pg 71 Photo of Sir James Vernon, Mr R H S Cavan and Mr A C Sackson Manager outside the branch. 1970 audited by Noel Bennett and audit clerk John Beer on their 6 months audit of Queensland branches from Surfers Paradise to Innisfail and west to Mount Isa and Pittsworth. Trip was done by car where visits were made to Cairns and Karumba along the way, returning to Brisbane via Longreach. 2007 Mount Larcom is 32Km North of Gladstone. 2007 photo by Don Chancellor who says "I have attached a couple of photographs taken late last year of Mt Larcom Qld Branch which I think closed in the mid to late 1970s. I worked there in 1968 and it was fairly quiet at that time - it was a bad day if we weren’t finished for the day before 3.30pm. The Manager’s office was on the left side of the building where the knotted curtain can be seen and the office and banking chamber were on the other side. There is a large mango tree beside the building which can be seen on the right hand side of the photographs and while waiting for the next customer, we would at times sit on the side steps and partake of some of those delicious fruit."